Hiring now for seasonal employees! Season operates early May to late September. Pre and post season work in April and October is sometimes available. Wages range from $11-$12.50 including a seasonal bonus. Positions available range from kitchen staff to retail to reservations to operations to customer service. Company incentives: Free tours for employees, crew parties/get togethers, fun working environment! Founded and run by the Binkley family, the Riverboat Discovery and Gold Dredge 8 are Interior Alaska’s premier workplaces for seasonal employment. 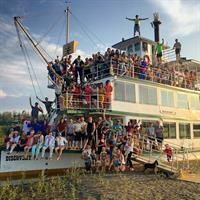 The Riverboat Discovery is one of the longest running tour operations in the state of Alaska and Gold Dredge 8 has amazing historical significance as it is on the National Register of Historic Places. Our crew members can expect to meet people from all over the world, learn the in’s and out’s of the Alaska tourism industry, and so much more. Many prominent Alaskans got their first job working at the Binkley family’s river and mining tours. Don’t let that fool you, though! Our crew is made up of a wide range of people with varied work experience. College and high school students, retirees, anyone looking for seasonal employment is welcome to apply!